Are there 'quick fixes' to increase student motivation? So that I’m not accused of sitting on the fence… for me, motivation is the holy grail in education. It is the key to not only our students’ success but also to our own satisfaction as teachers. In this presentation at a recent all-staff meeting at The International School of Lausanne, I started by asking teachers to share ‘things that frustrate them’ about their students. Asking a question like this right at the end of a semester, with many tired faces in the audience, certainly didn’t take long to generate a rich variety of responses; not handing in work on time, arriving late and unprepared, not participating in class, constant low level chatter, using phones in class… I am sure most of us can relate to many of these issues that are common place in schools the world over. Next, I asked for the opposite; times when you felt you really loved your job, when everything was going well in the classroom. Thankfully, this also did not take long to produce a variance of answers; students all contributing, insightful questions, assignments that ‘wowed’ the teacher, students really enjoying their learning. I would argue that the bridge that fills the gap between these two phenomena is “motivation”. When our students are motivated, they participate, they arrive on time, they hand in quality work, they ask great questions and produce thought-provoking, insightful, knowledgeable answers, they smile, they laugh, they want to improve, they want to learn. What does this do to us as teachers? Quite simply, it makes us feel great. We feel good at our jobs, we feel like our kids are progressing, we feel like we chose the right career, we feel like we are making a difference, we feel motivated. But how do we achieve motivated learners in our classes? Are there any ‘quick fixes’ for motivation we can apply straight away? Thank you to @MathsTweetcher for this question and the inspiration behind this blog. The good news is that yes, there are things we can all do, with very little time and effort, to increase motivation right away amongst our learners. 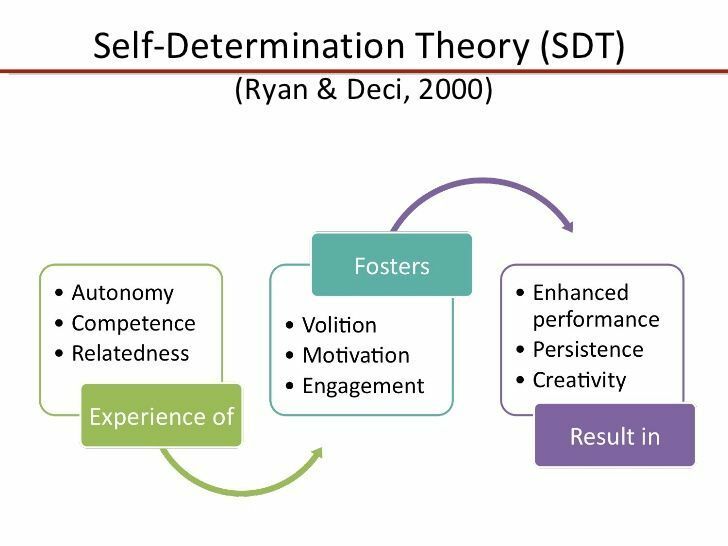 According to Ryan and Deci’s (2000) Self-Determination Theory (SDT), intrinsic motivation (which involves engaging in tasks out of pure joy and interest) is increased when we meet the basic psychological needs of autonomy, relatedness and competence. SDT, which originated in psychology, has already been extensively researched and tested across a variety of domains including medicine, coaching and education, and is widely considered and accepted as a robust method to augment motivation. Autonomy is related to choice, self-direction, and student ownership of learning; relatedness refers to a sense of belonging, support, inclusion and relationships while competence is concerned with students’ perceptions about their capacity to achieve success. This 2006 study, for example, looked at the motivational pull of videogames and found that playing videogames clearly met the 3 needs of SDT and henceforth, why so many people are so motivated to keep playing them. Players have complete autonomy in where and what they do in any given game; there is a strong sense of relatedness as gamers have an immediate connection to a community where they can share their passion; and gamers feel a great element of competence while playing as they pass from one level to the next. As part of my Doctorate in Education at the University of Bath, I also put SDT to the test in my own context, engaging in this qualitative research study with a group of Year 10 students (aged 15-16) about their experiences of learning languages through storytelling. Teaching Proficiency through Reading and Storytelling (TPRS) is a method of language teaching that, I found, consistently generated lots of positive responses on feedback forms and seemed to really engage the kids. In the study, according to the students themselves, TPRS visibly met the SDT needs of autonomy, relatedness and competence and this in turn meant it was a highly motivating approach to language learning. They reported believing they could “steer the learning” and “effect what would happen next” which led them to feel “more involved and more in control” of their learning (Autonomy). In addition, they felt the stories “helped them to understand everything better” and “really improved their speaking” (Competence). Finally, they reported that stories were “very extroverted” meaning “everybody will feel included” and “everybody gets to participate”, which made them “less scary” as “you don’t get judged” because “everyone was doing it as a group” (Relatedness). Autonomy: Can I adapt the activity to allow students more choice or self-direction? You can still set the task but by allowing them different ways to show their learning and fulfil the objectives, you are heightening their level of autonomy and creativity, and you are on your way to a more motivated class. Relatedness: Can I re-plan this so students have a greater sense of belonging and togetherness? Perhaps students can attempt a task in pairs rather than individually? Can students or (you as the teacher) share a personal anecdote connected to the lesson? Maybe there is an opportunity for you as their teacher to ‘get among them’ and do the task with them? All this improves relationships and leads towards more ‘relatedness’ in the class. Competence: Is the activity going to help students feel like they can ‘do’ it? Is there a way to modify the activity so students can show off what they’ve just learned to each other? Another very simple way to augment students’ feelings of competence is just to recognize, highlight and share something good you see in the class, something that demonstrates understanding of the concepts. By explicitly highlighting successes and learning, students feel like they ‘are getting it’, they feel more competent. Yes, building self-determined, highly motivated learners, can be a challenge but by making small adjustments to our lesson planning using SDT and creating an ‘ARC’ (Autonomy, Relatedness, Competence) in our classes we can at least help students to enjoy and engage in the lesson more, even if the content or subject matter is not of particular interest to them. If we want engaged, smiling, inquiring students who are achieving their potential and learning, its time we concentrated more on ‘motivating’ and less on ‘laminating’. ​Please share your comments and whether you have any activities you feel already have students on an upwards ‘ARC’ towards motivation.